There’s hope in our world after all: The U.S. Supreme Court ruled Monday that a landmark climate case, Juliana v. United States, should go to trial. 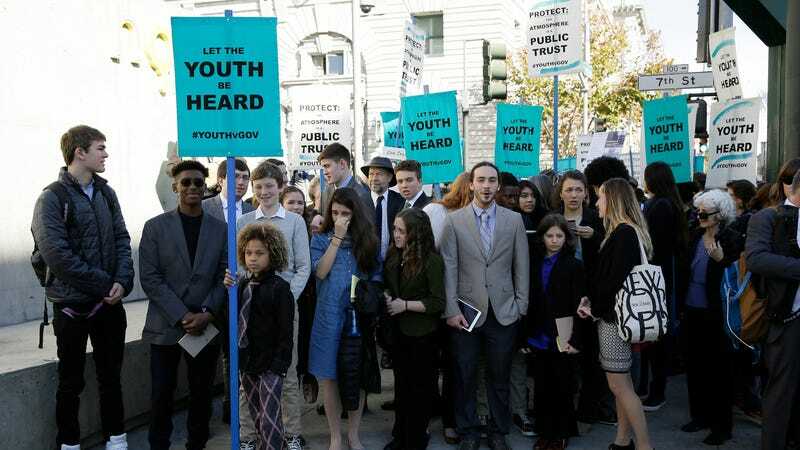 Yes, the one where 21 kids are suing the federal government because they believe a world where climate disaster isn’t rampant—a world where they can live healthily, happily, and in pursuit of happiness—is a constitutional right. The Government’s request for relief is premature and is denied without prejudice. The breadth of respondents’ claims is striking, however, and the justiciability of those claims presents substantial grounds for difference of opinion. The District Court should take these concerns into account in assessing the burdens of discovery and trial, as well as the desirability of a prompt ruling on the Government’s pending dispositive motions. These meddling kids want the government to take swift action to rein in seemingly never-ending U.S. greenhouse gas emissions that continue to warm up the planet. More specifically, the plaintiffs want a consumption-based inventory of U.S. carbon emissions, an enforceable plan to stop climate change, and a complete end to the Energy Policy Act, which advocates for “clean coal” (whatever the hell that is). Now, both parties are set to make their case before the U.S. District Court in Eugene, Oregon. Despite the battle left to fight in court, this is a hopeful turn of events given how hopeless the courtroom has become for climate litigation, from California to New York where lawsuits filed by states and cities were dismissed. Those lawsuits were against oil corporations, though. We’ll see if suing the government proves to be more fruitful. Colombia, at least, has seen some success. The U.S. could be next. Update 7/31/18 3:19 p.m.: This post has been updated to include a comment from the Department of Justice.